Every year Australians come together on Anzac Day (25 April) and Remembrance Day (11 November) to remember those who fought and lost their lives in wars and conflicts throughout Australian history. From a moment of silence and wreath-laying at schools, to dawn and official services at dedicated sites with ‘The Last Post‘ played, there are a number of memorials across the country where you can pay your respects and remember those who sacrificed their lives for our freedom. Completed in 1934 on the southern extremity of Sydney’s Hyde Park, the ANZAC War Memorial was built as a memorial to the Australian Imperial Force who fought in World War I. Following the first anniversary of the Anzac’s landing on Anzac Cove for the Battle of Gallipoli during WWI, fundraising began and by 1929 a competition for the memorial’s design was commissioned. 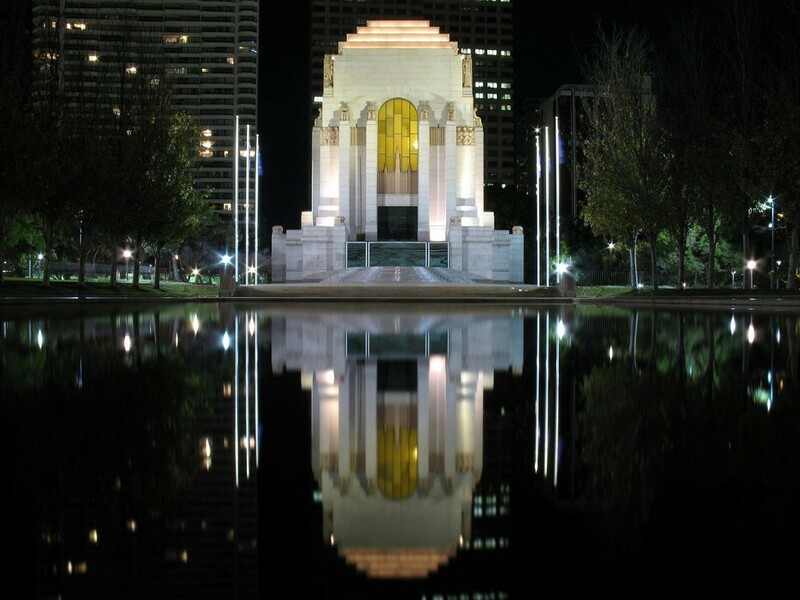 Designed by C. Bruce Dellit with monumental sculptures by Rayner Hoff, this concrete building – featuring Art Deco setbacks and large, arched yellow-stained glass windows – is positioned with a large ‘Lake of Reflections’ symbolising the area in which the Australian troops fought. 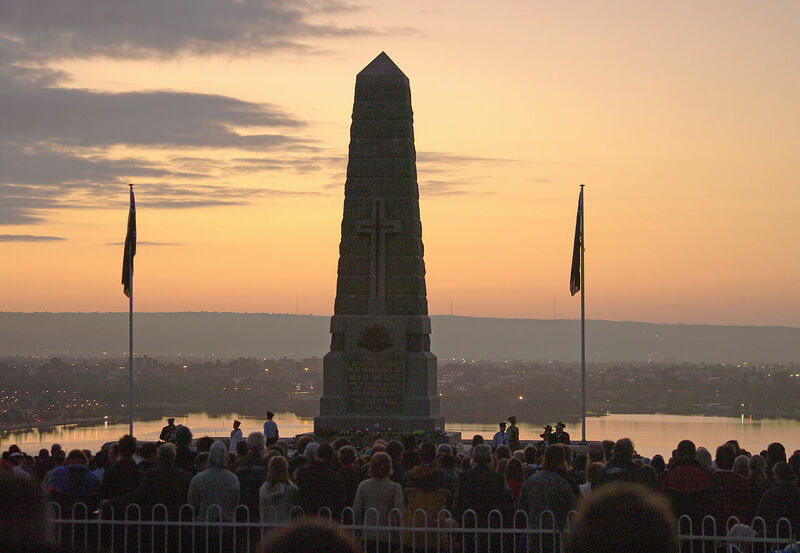 Today, the memorial is used in commemoration ceremonies for Anzac Day, Remembrance Day and other important occasions. Widely regarded as the world’s ‘most significant memorials of its type,’ the Australian War Memorial in Canberra stands as the ‘national memorial to members of armed forces and supporting organisations who died or participated in wars involving the Commonwealth of Australia.’ This memorial today consists of three parts: the shrine (Commemorative Area, including the Hall of Memory and the Tomb of the Unknown Australian Soldier), the museum (Memorial’s Galleries) and the records (Research Centre). Australia’s official World War I historian, Charles Bean, first visualised this memorial whilst observing the battles in France in 1916. Following this, the Australian War Records Section was established in May 1917 to preserve records of the war at the time. An architectural competition in 1927 led to two individual entrants, Emily Sodersten and John Crust, to represent a joint design for this memorial. Due to limitations at the time due to the Depression, the memorial wasn’t opened until 1941, following the Remembrance Day ceremony. Marking the 75th anniversary of the conclusion of WWI, the Tomb of the Unknown Australian Soldier was added. 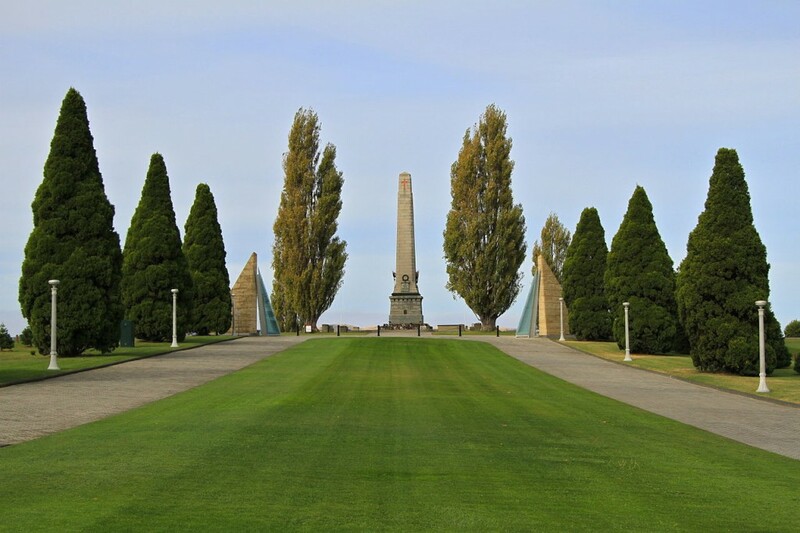 Tasmania’s main commemorative military monument, The Cenotaph, overlooks the city and the River Derwent. The public competition held in 1923 awarded Hobart architectural firm Hutchinson & Walker with the honour of creating their 19.8-metre tall design, however, increasing it to stand at 23.3 metres tall. This Art Deco reinterpretation of the traditional obelisk from Egypt was originally constructed to commemorate the Tasmanian soldiers who died in World War I, with an original inscription reading ‘Lest We Forget 1914-1919.’ Although the war ended in 1918, the inscription was kept as 1919 to commemorate the Treaty of Versailles, which was indeed signed that year. 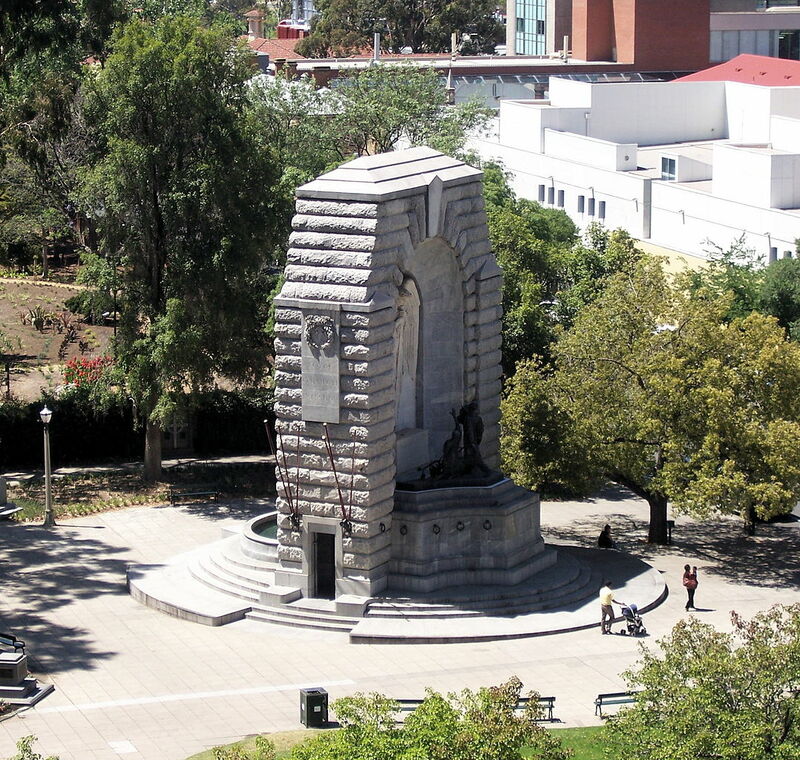 However, today, like most memorials in Australia, The Cenotaph stands at the centre of Anzac Day ceremonial services. First proposed in 1919 and funded by the Parliament of South Australia, the National War Memorial was the first Australian state war memorial confirmed after, and to commemorate, World War I. After the 26 designs from the first design competition in 1924 were destroyed by a fire prior to judging, a second competition was held in 1926, producing 18 entries, of which the architectural firm Woods, Bagot, Jory & Laybourne-Smith won. The significance of this memorial was important to the state, as almost 8.5% of the entire state’s population (roughly 35,000 people) served in WWI, of which over 5,000 of them died. 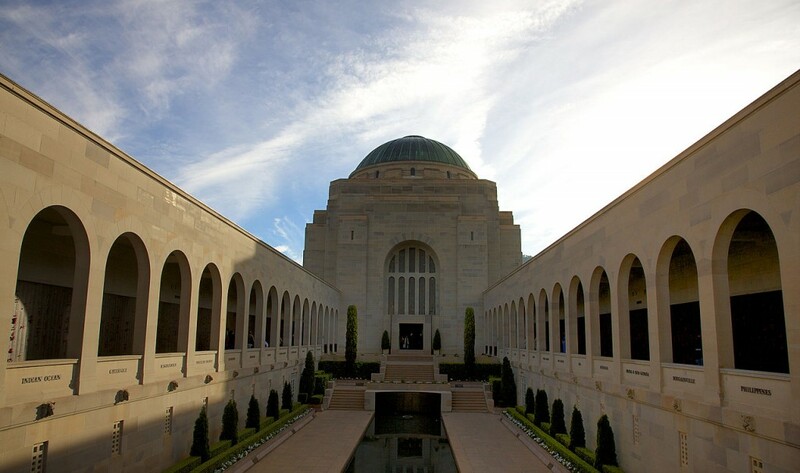 Opening in 1931, the memorial depicts two scenes – the prelude and the epilogue of the war – depicting both the ‘willingness of youth to answer call of duty and the extent of their sacrifices.’ The inner walls of the shrine are lined with bronze tablets that list the names of the South Australians who died during the Great War. 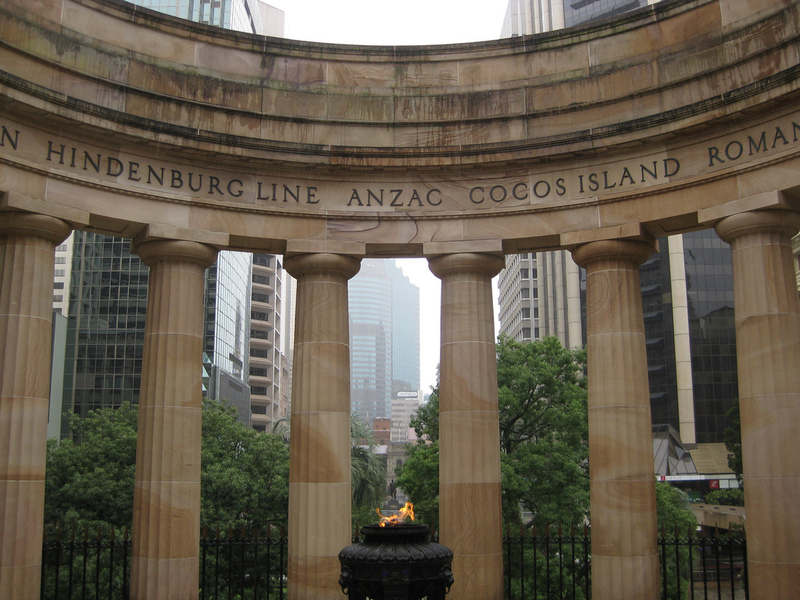 The key component of the Queensland Heritage listed square, Anzac Square, is the Shrine of Remembrance. 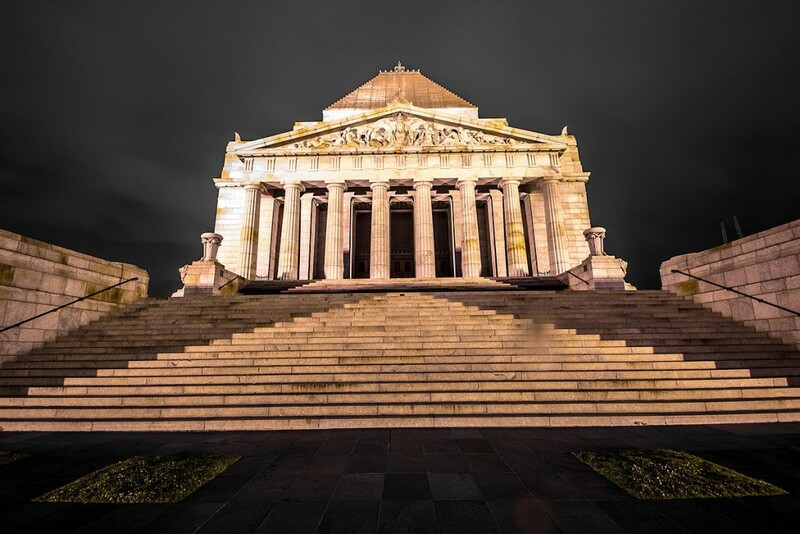 Standing as Brisbane’s ‘major landmark of cultural, architectural and historic importance,’ this memorial annually hosts services for both Anzac Day and Remembrance Day. In 1928, a design competition was held – of which public funds were raised for a memorial dedicated to the fallen soldiers from WWI – and the proposal of a Greek Revival structure by Sydney architects Buchanan and Cowper was chosen. After two years of construction, the memorial was dedicated to the Anzacs on Remembrance Day in 1930 by Governor John Goodwin. The memorial has 18 columns symbolising the year 1918, when the war ended, and an ‘Eternal Flame’ that continues to burn in a brass urn within the shrine. Today the memorial contains memorial plaques for both WWI and WWII.